Experience the only way to catch a cool breeze in Arizona's heat, by jumping from an airplane 10,000 feet up while flying through the blue skies of Phoenix at 120 mph. 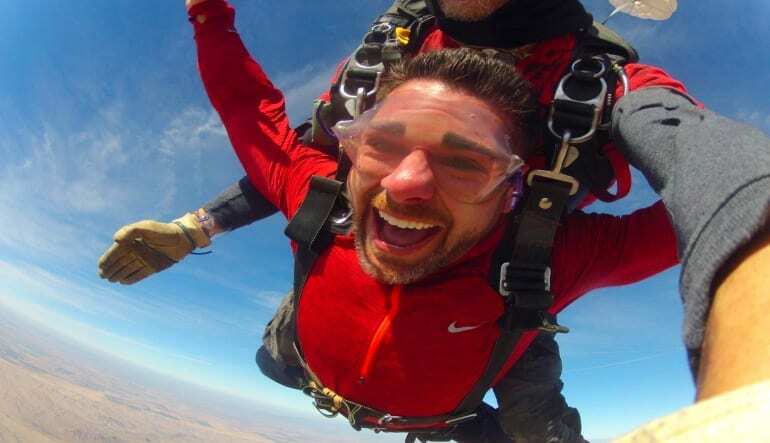 Experience the only way to catch a cool breeze in Arizona's heat, by jumping from an airplane 10,000 feet up while flying through the blue skies of Phoenix at 120 mph. You will be jumping with the best around and the dropzone is conveniently located just 40 minutes South of downtown Phoenix at Casa Grande Airport. Upon arrival you will meet your personal tandem master who will be jumping with you. From there you will go through a short ground training where you learn everything you need to know to make sure your jump is safe and enjoyable. You will have plenty of time to ask questions, so you will be completely comfortable throughout your experience. Great fun! Our dive partners were excellent entertainers and we felt perfectly safe at all times. The staff was incredibly professional helpful and jus really cool people. One of the best experiences of my life!!! Max weight 240 lbs. ; surcharge may apply for guests weighing over 200 lbs. Our instructors are fully licensed and have logged thousands of jumps.